How to Format a Table of Contents? I've been searching but I can't find any articles on how to format a Table of Contents. I simply want to format my TOC so that the topics are all flush left and the page numbers flush right with dots connecting them. Re: How to Format a Table of Contents? dsw67, are you creating the TOC manually or automatically? The instructions for each are dramatically different. GarryP, in which of the two situations does a.l.e's advice not work? Creating a TOC manually is a very different process to creating it using the in-built functions. a.l.e's suggestion of "simply create a paragraph style with a right tab, with a dot filling..." doesn't give the user enough information. 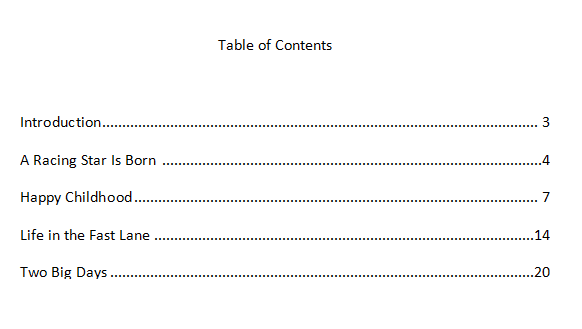 If the TOC is being created manually then they need to apply the style via the PP. On the other hand, if they are creating the TOC automatically then they need to tell the TOC to use the style via Document Setup. Just creating a style doesn't apply any formatting changes. The formatting must be applied and how you apply it is different in each case. So, in this rare case, a.l.e's advice does not actually do anything in a practical sense.